While treading through the piles of emails and other digital correspondence that people regularly send me on Office Supply related topics (actually, I made that whole part up), I happened up on some awesome original Post-it art. 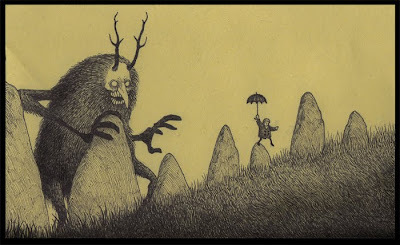 I ran across John Kenn's blog/art gallery of monsters called, oddly enough, Don Kenn Gallery. I assume that he is John Donald Kenn or Don Jonathan Kenn and goes by either name depending on what the situation calls for and just goes with it. His name doesn't really matter since he's not drawing these monsters to attempt to become the next big meme, but it is a point of curiosity. Of course again with most Office Supply artists, a big part of the work is taking common place items and in this case making a "little window into a different world." 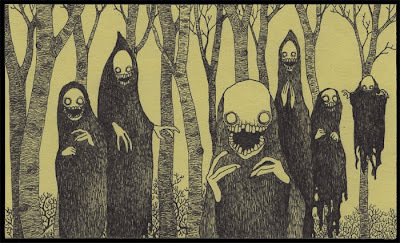 Information on John Kenn is pretty slim and sparse, but I managed to track down an interview with him over at My Modern Metropolis. It is about as much as you would expect from an art enthusiast blog, all about inspirations and what his current "real" job is. They wouldn't ask him a hard question like "What brands of adhesive notes are you using?" If anybody has a way to get in touch with John, I would also like to ask him he uses the ubiquitous BIC Round Stic as well to flush out the using Office Supplies theme. 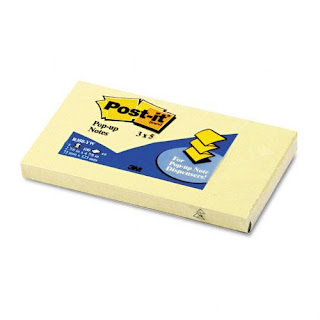 It is obvious that he prefers to use the slightly less common rectangular Post-it notes and the blog title does say he uses Post-it notes so we'll assume he uses the proper 3M branded stuff. He does have some pieces that use a square Post-it note, but the most common stuff now is on a rectangular Post-it note. If you have a penchant for monsters in your office doodles you'll want to click that ghastly image above and check out his work. If the monsters were more cartoony and poorly drawn, surrounding notes about synergistic interactions, it would look like something from my regular meeting notes. Chalk another blog entry to "I'm way behind the times" if you like, but I just recently started to look at some of this Papercrafting in a more serious light, and I'm impressed. Origami (as talked about previously) is all about folding a piece of paper, but Papercrafting is all about folding, along with cutting and pasting. When you are allowed to cut and paste, you enter a whole new realm of paper art and as you would expect, the results can be downright astonishing. 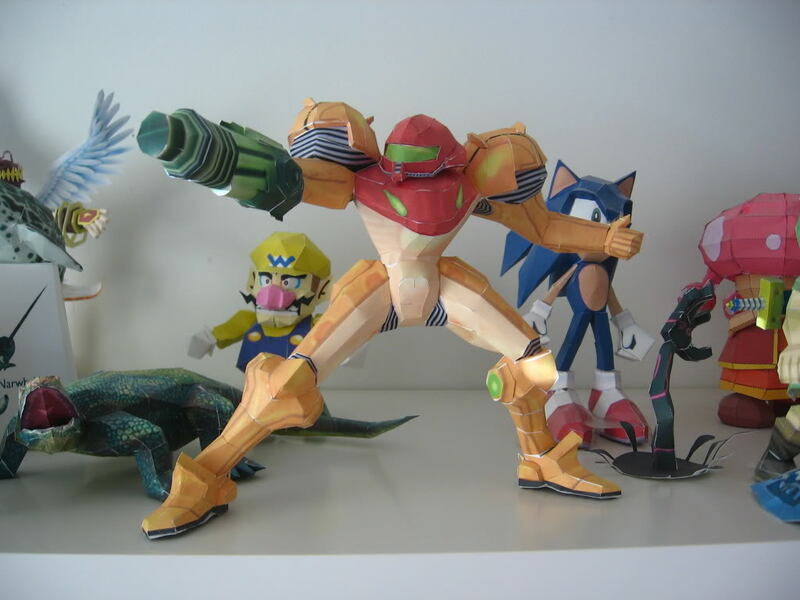 If you start looking online for Papercrafting, you will no doubt discover that a large portion of the Papercrafting community centers around building video game characters and objects from video games. Because Papercrafting is essentially reverse-engineering a 3d model, people have been able to grab models from video games and lovingly recreate each polygon as a cut or folded piece of paper. There are sites dedicated to recreating Nintendo Characters or specifically Pokemon. Of course, there are different versions of the same character in different poses from different games. 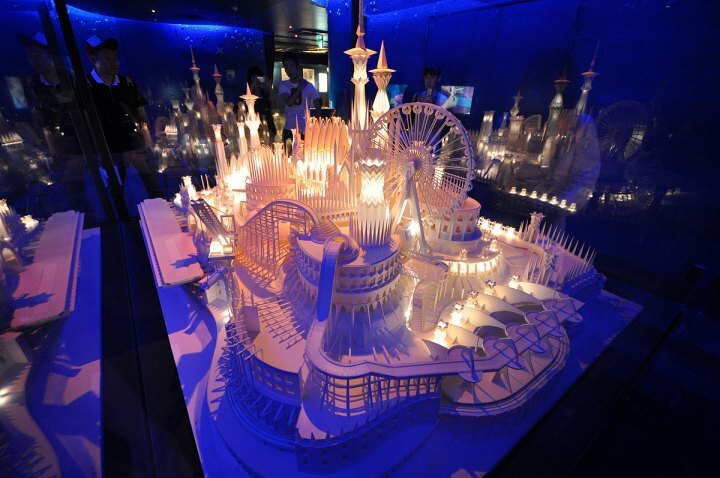 If you want to think outside the box and build an original piece of artwork, you can take a cue from this giant Papercraft Castle built in Tokyo, but you are going to have to start with the same basic materials. As suggested by Nintendo Papercrafting, you'll want to find some glue, a knife , cutting mat and some paper; unfortunately, the products they list aren't available outside of Europe. Powerpritt Universal Gel is suggested as an ideal papercrafting glue, but I think Elmer's Office Gel Glue Stick should work perfectly as it is easy to apply and will dry quickly. An X-Acto Cutting Set should be the perfect fit for you papercrafting cutting needs, the kit comes with a self healing mat and several replacement blades. Lastly, you aren't going to find any 120gms Card Stock around, but I dug around and this 67lb Bristol Cover Stock is just what you are looking for (at the equivalent of 148gms). 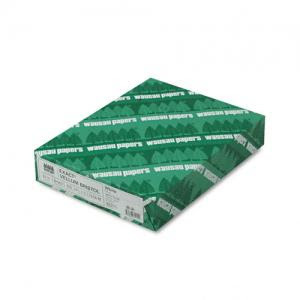 Now that you've got your supplies, time to get out there and do some Papercrafting and create something. Newell Rubbermaid has been doing some odd things with the Sharpie brand lately (like expanding their lines to the Sharpie Pen and Sharpie Liquid Pencil) but in most people's eyes they are still best known for selling the good old reliable black fine point sharpie marker. 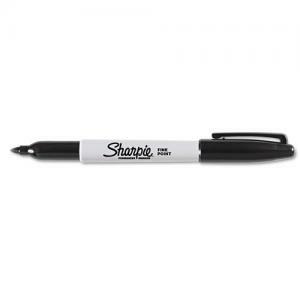 Everybody I know has a cache of these sitting around their house somewhere and everybody I know prefers the full-blooded Sharpie to any of the lesser generics. A Sharpie is a Sharpie is a Sharpie. You always know what to expect and they are readily available just about anywhere at discount prices. 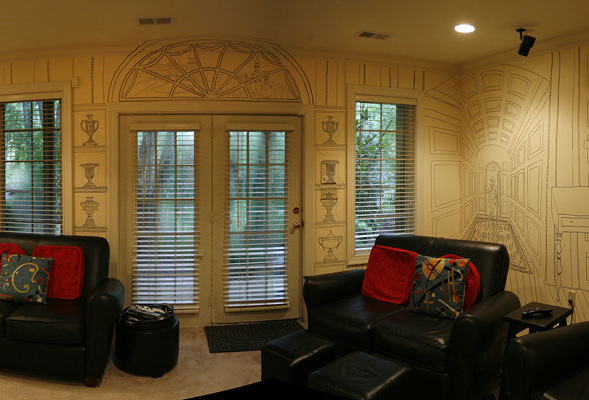 Because of this consumer friendly permanent ink, it makes a great option for artists working on the cheap or making any number of artistic statements. From Charlie Kratzer in Kentucky who decorated his whole basement in Sharpie line art to Meilena Hauslendale (she managed to nab the SharpieArtist.com domain name) who sells her Sharpie and Watercolor Artwork to a wide swath of the population. Even more graffiti inspired artists like Chris Dunlap (which seems a more classical fit to the Sharpie marker) has done some cool stuff, and even tricked out his Pontiac Fiero then covered the right side in Sharpie. In my own personal endeavors I've used Sharpies as a compliment to just about anything I've ever done. Painting a black line that is smooth and even is just to difficult for me to do with a brush. Of course the people who work at Sharpie wouldn't be in Marketing if they were unable to recognize this burgeoning audience of artists and market to them. So Sharpie created Sharpie Uncapped to showcase some unique uses of their products. This is one of those gray areas of marketing that nobody really understands. If people are using your product to create underground art because your product is common place, and you take that underground art and promote it on your fully branded glossy web 2.0-ish site, does it degrade the very underground nature? I'm going to diverge from the straight and narrow of Office Supplies again because I saw a pair of gloves being sold as "Safety Equipment" - that is tangentially related to Office Supplies. I've never been in a proper office that required people wear gloves designed in a specific color to help "hide grease and grime," but every small-business is unique. Kimberly-Clark sells these knit nylon gloves where the entire usable surface is coated in foam (Yes, you can make a solid coating of foam). Solid foam, aside the thing that caught my eye about these gloves is that they carry an Abrasion Resistance Rating of 4 out of 4 using EN Standards. That's not a great photo, it looks oddly alien, but don't mind it. 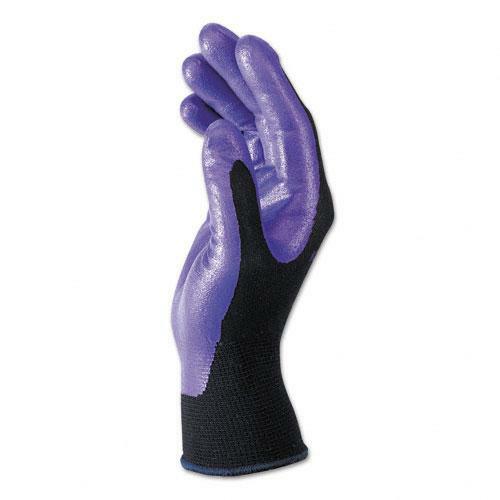 These Abrasion Resistant Gloves are available in a rage of sizes as Medium Gloves, Large Gloves, or X-Large Gloves. 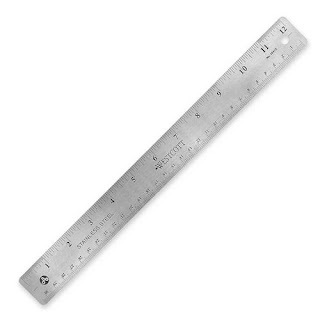 So I was curious about just how Abrasion Resistance was measured and what that actually means, so I went digging. First thing I found was a page with a bunch of tables and a bunch of overly technical nonsense, but it did tell me that the EN Standards refers to the EN388 Mechanical Rating and that a rating of 4 means that it took more than 8,000 cycles "to abrade through a sample glove." Of course inquiring minds want to know what kind of cycles, and what kind of abrasion? 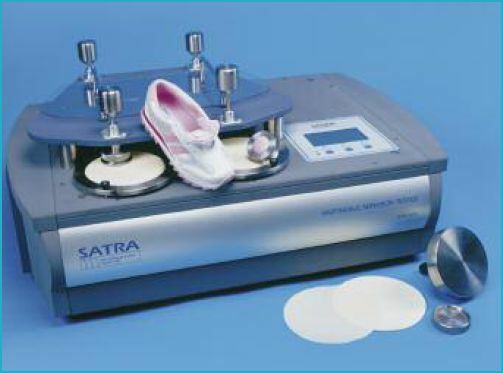 So I went looking some more and found this company called SATRA that builds an abrasion machine that is the industry standard for these tests. I have no clue how it works, but I found this photo of the machine in action that provides no actual insight. I found another document that states 300g/m glass paper as the abrasive source (glass paper is just like sandpaper except with glass particles). I also found that SATRA sells this awesome Pedatron that is essentially a giant Android leg that will test your carpet and/or shoes for wear. In conclusion, for The Kimberly Clark Abrasion Resistant Gloves to receive their 4 out of 4 rating they need to survive 8,000 attacks from a sand paper machine before it wears through. Have you seen the prices on highlighters these days? They come in a wide variety of colors and they are dirt cheap. I was looking at them, and it turns out the standard chisel top highlighter that we all love is known as a "Tank Style" highlighter. Not a Tank like the armored vehicle but more like a storage tank because it holds a lot of ink. Speaking of Tanks, did you know that they are still creating and publishing Tank Girl comics? Yeah, that odd film (of the same name) from '95 didn't kill the franchise. 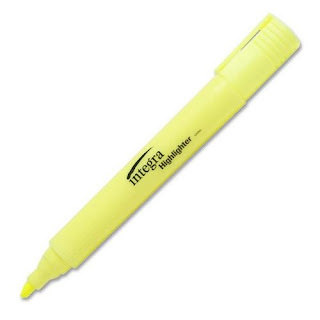 A single yellow highlighter can currently be purchased for only 38 cents, and I don't know how volatile the highlighter market is, but you will probably pay more or less for a highlighter when you actually purchase it. Now for 38 cents you aren't going to get anything fancy, but you are going to get a tube of plastic enclosing a bunch of florescent yellow pigment that can be easily dispensed when you want to. 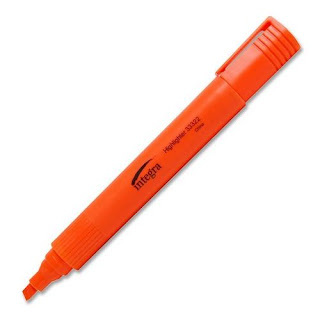 A single orange highlighter can currently be purchased for only 43 cents. Why is orange exactly 5 cents more? Nobody knows. Maybe making the yellow highlighter 5 cents cheaper is a nod to the vast Yellow #5 conspiracy. It clearly isn't a matter of supply and demand that makes the yellow highlighter cheaper, because everybody always wants yellow highlighters. I can only assume that it is a matter of the economics of scale. Integra makes so many more yellow highlighters that they are able to produce them slightly cheaper than the orange ones, and when you consider that their markers are almost identical, you have to really be manufacturing a lot more yellow markers to make up that difference.